Action Performance Companies Inc., the leader in the design, promotion, marketing and distribution of licensed motorsports merchandise, today teamed with the rock band KISS as well as drivers from Richard Childress Racing and Kevin Harvick Inc. and representatives from Chevy Racing to announce the specifics behind a program that will have race fans in Richmond "rock ’n’ rolling all night" throughout the NASCAR race weekend in September. All of the drivers that will honor KISS on their vehicles are backed by GM Service and Parts Operations, the only company with major sponsorships in all three of NASCAR´s top divisions. The famous KISS visages, representing the seminal rock band who have created a remarkable 30-plus albums and a career-spanning box set among their music catalog, will be the subject of special paint schemes featured on the No. 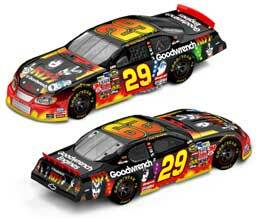 29 GM Goodwrench and No. 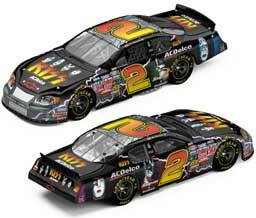 2 ACDelco Chevrolet Monte Carlos driven by RCR teammates Kevin Harvick and Ron Hornaday, respectively, and the No. 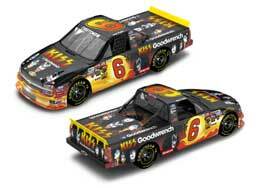 6 GM Goodwrench Chevrolet Silverado truck driven by Matt Crafton, the first driver for the Kevin Harvick Inc. race team. Renowned motorsports artist Sam Bass designed the special paint schemes. The three KISS machines are among many slated to share a music-themed paint scheme in honor of the Chevy Rock & Roll 400 race weekend at the three-quarter-mile Richmond oval in September. Action Performance also designed the official Chevy Rock & Roll 400 pace car, which was unveiled today with the KISS machines. The KISS vehicles will be featured during respective NASCAR Craftsman Truck, Busch and NEXTEL Cup Series races on Thursday night, September 9; Friday night, September 10; and, Saturday night, September 11 at Richmond International Raceway. This program marks the first time that the band has been featured in all three major NASCAR series in one weekend. Since fall 2001, KISS has maintained a "rock ’n’ racing" connection with both the NHRA and NASCAR race circuits, appearing on cars, dragsters and at trackside events. "KISS has been a colorful addition to the racing world since they first appeared on the NASCAR and NHRA scene in 2001," explained Fred Wagenhals, Action’s chairman, president and CEO. "In addition to the pulse-pounding music that sets up the excitement for an event, the KISS Army lines up to support their all-time favorite band. I think race fans who enjoyed the rock ’n’ roll theme of last year’s NASCAR weekend in Richmond will be ready for the guitar-and-metal crunching energy of Chevy Rock & Roll 400, part two, with KISS." For information about all of the vehicles participating in this year’s Chevy Rock & Roll 400 races and die-cast replica availability, including KISS and the Chevrolet Monte Carlo pace car collectibles, contact Action’s standard distribution channels. To reach one of 17 Action Racing Collectables distributors, call the locator line at 1-800-411-8404. 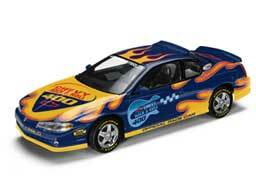 The Racing Collectables Club of America can be reached at 1-800-952-0708 or visit RCCA online at goracing.com. Look for a future announcement regarding the complete lineup of Chevy Rock & Roll 400 cars, drivers and participating musicians.